While the embroidered patches are a common sight on the uniform of a U.S. soldier, sailor, airman or Marine, few people who haven’t been in military service know exactly what each of the patches and emblems mean. There are specific patches, designs and regulations covering what can (and cannot) be worn on a U.S. military uniform. A unit patch is most often seen on the left shoulder of the combat uniform. This illustrates the specific group that and individual is part of, in the Army, it’s usually a division; in the Navy, the patch is for individual ships. 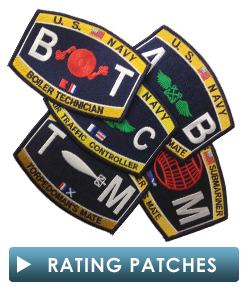 Navy personnel also have job qualifications, Rating patches detail the jobs of Navy personnel, specialties commonly known as a rating. On the left sleeve of the uniform, each sailor will have a specialty embroidered insignia to signify their specific rating. Other branches of the military have skills patches, such as the Army’s Ranger or Special Forces tab. Soldiers who have qualified for these patches are permitted to wear them at all times, independent of their current unit assignment. Enlisted members in all the military branches wear a rank patch on their left sleeve of their service and dress uniform coats. As rank determines who is supervising and responsible for a military unit, this patch is prominently displayed in non-combat situations to clearly denote who is in charge. 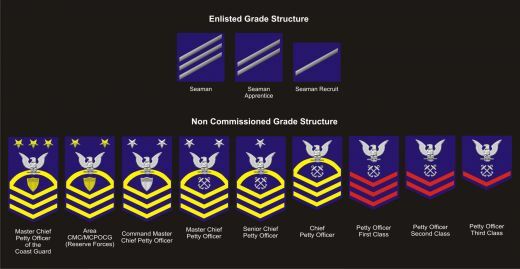 In a combat situation, there are subdued color rank patches, making it more difficult for combatants to determine who is the ranking commissioned and non-commissioned officer in a given situation. All members of the U.S. military wear an embroidered flag patch on their right shoulder, an easily distinguishable sign to differentiate them from soldiers of other nations. Often, a reversed flag patch is used (stars on the right rather than the left) as if the flag was flying from a pole moving forward. Members of the U.S. Army and some members of the U.S. Air Force wear soft headgear (as opposed to a billed cap) These hats carry an embroidered patch on the front, commonly known as a flash. The flash depicts the wearer’s military unit. Pilots and flight crew of the Air Force, Navy and Marine aviation units will often have unit patches on their flight uniforms and these embroidered squadron or wing emblems are even seen on the nylon or leather jackets favored by pilots. New flame-proof coveralls being issued to the Navy’s sailors, replacing the utility coveralls that have been the standard work uniform for shipboard personnel. A downside of the new protective gear is embroidered patches are NOT permitted to be sewn on. The fabric patches diminish the flame-retardant qualities of the next-generation workwear. 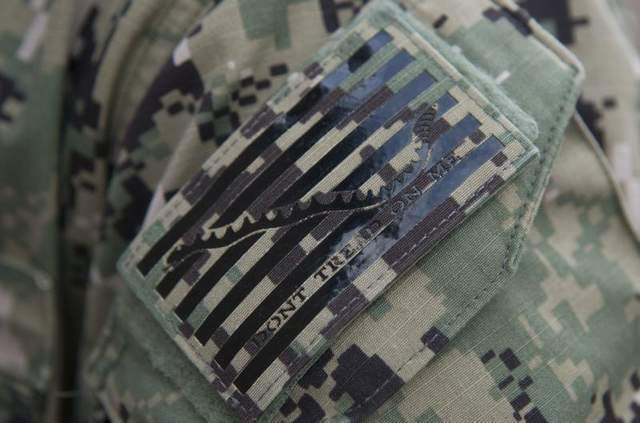 Many U.S. Navy personnel also proudly wear the Navy Jack patch, the iconic “Don’t Tread On Me” image that dates to the Revolutionary War era and the first Continental Navy sailors in 1775. Over the years, Chicago Embroidery Company has made millions of patches for military uniforms. See what we can do for your group or team by visiting www.c-emblem.com , contacting sales@c-emblem.com or call 312/664-4232.